11.1" x 7.6" stitched on 14 count. 8.6" x 5.9" stitched on 18 count. Celtic Centrepiece and Napkin 1 cross stitch pattern... 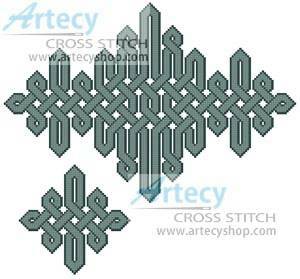 This counted cross stitch pattern of a celtic design would look good for a Table Centrepiece and Napkins. It was created from the Celtic Knot Font from www.Clanbadge.com. Only full cross stitches are used in these patterns.